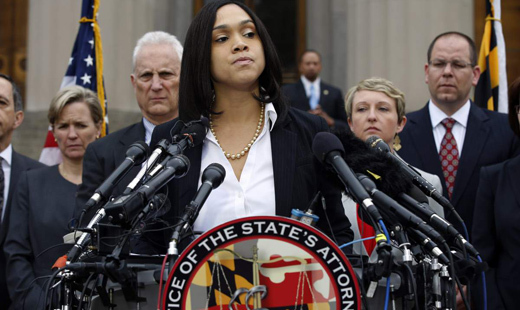 BALTIMORE – Just hours before the scheduled start of a huge march and rally by the Baltimore United Coalition here, the state’s attorney, Marilyn Mosby, announced multiple criminal charges against six police officers in the killing of Freddie Gray. The 25-year-old man was arrested and thrown into a police van Apr. 12, emerged with a severed spinal cord and larynx and died several days later. The officers are charged with second-degree murder, manslaughter, and assault. The charges were announced as thousands prepared to join peaceful rallies and marches in Baltimore, continuing a week of demands for justice in the latest police killings that have sparked protests in cities across the nation. The charges were announced a day after the Baltimore police had completed their own investigation into Gray’s death and had submitted their findings to the State’s Attorney. Mosby told the press that her office decided to file the serious charges after having conducted numerous interviews of witnesses, reviews of medical records and examination of the route taken by the driver of the police van. She said that the decision also came after review of the police department’s own report and an autopsy that concluded Gray’s death was the result of homicide. Mosby said her department’s investigation answers one of the big questions concerning Gray’s death, the issue of exactly when the fatal injuries occurred. She said those injuries occurred after he was shackled and thrown into the van, without any restraints to protect him. Mosby also charged that police failed to obtain medical care for Gray even though it was “abundantly evident” that he was in serious distress. When Mosby announced the indictments the crowd assembled near the War Memorial downtown cheered and broke out into applause. John Wojcik and Margaret Baldridge contributed to this report.